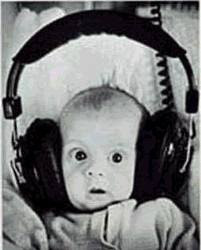 Dear Readers, Welcome to "Market Noise". Here are some of the articles and clips worth reading and watching. There are millions and one things going on in the world. How could you keep up with all the new information that could potentially impact your investment or business? How could you filter out the nuggets from the noise? We provide the most relevant and impactful info for your reference so that you could make a better decision in your whatever venture. Hope you enjoy your stay here! The blogger of this blog is currently not available. It is a fact that a simple, equal-weighted portfolio will beat a capitalisation-weighted benchmark over time, if the distribution of capital across the stocks in the benchmark is reasonable. This can be proved mathematically using stochastic portfolio theory. Let’s take the S&P 500 Index and suppose its largest stock weighting is 5 per cent and its smallest stock weighting is 0.0001 per cent. If you arrange these 500 stocks from largest to smallest along the horizontal axis of a chart and plot the stocks’ S&P 500 weights on the vertical axis, the resulting descending curve is called the capital distribution curve. For more than 80 years, the capital distribution curve of actual broad capitalisation-weighted equity benchmarks has conformed to a typical shape that has a reasonable balance of large, medium and small stocks. It should not be surprising, therefore, that from January 1 1966 to June 30 2010, a simulated equal-weighted portfolio of the S&P 500 stocks beat the capitalisation-weighted S&P 500 by an average of about 3 per cent annually. Why is that? It has long been thought that the outperformance of equal-weighted portfolios versus cap-weighted portfolios is due to the “small-stock effect” – small-cap stocks have greater returns than large-cap stocks. However, our alternative interpretation is that equal-weighted portfolios outperform the market over time by capturing relative volatility. This is a consequence of the trading rule required to maintain equal weights, which is to buy after a negative relative return and to sell after a positive. To the extent that stocks move up and down relative to the cap-weighted benchmark, the trading rule has a “buy low/sell high” character, which generates outperformance. Remarkably, it can be shown that the underlying alpha source is always positive, which is another indication that the excess return has something to do with volatility. Things such as stock returns move up and down; however, stock volatilities are always positive. Why then do equal-weighted portfolios have great tracking error over time relative to the cap-weighted index? The answer involves diversity. Diversity is a measure of the concentration of capital among large and small stocks and depends on the capital distribution curve. Diversity is at a maximum if all stock capitalisations are equal; it is at a minimum when one stock’s capitalisation accounts for virtually the entire market. If large stocks outperform small, the capital distribution curve gets steeper and diversity declines. Changes in diversity influence relative return of the equal-weighted portfolio. Since the capital distribution curve has a typical shape, diversity must have a typical value, and no long-term trend. In this case, the influence due to changes in diversity will be close to zero over time, and the outperformance of the equal-weighted portfolio will be close to its volatility-based source, which is necessarily positive. To summarise, stochastic portfolio theory shows mathematically that the relative return of an equal-weighted portfolio with respect to its capitalisation-weighted benchmark is the sum of two components. The first is the relative-volatility capture rate, which is the true, underlying source of alpha for the equal-weighted portfolio, and is always positive. The second is the influence of a true size factor, called diversity. Changes in diversity are the source of tracking error. The power of this approach is that it provides a precise and useful decomposition of relative return, which is not explained by the “small-stock effect”. The establishment of an always positive alpha due to volatility capture is meaningful. Any time one observes a true positive alpha source, it raises the following question: can it be harnessed to generate long-term returns? An example is an equal-weighted portfolio, but this is volatile. There are more efficient ways to capture relative volatility. Such approaches require only a forecast of the volatilities and correlations among stocks. The result is that more efficient relative volatility capture strategies have higher information ratios, higher expected alphas and experience fewer and less severe underperformance periods, attempting to gain benefit of the alpha source while “smoothing out the ride”. (SINGAPORE) While just about everyone hails the rise of China as the new economic powerhouse, economist Norbert Walter maintains that America, for all its woes, will remain the global superpower in the decades ahead. China may well be the 'locomotive' for now and even the next five years, 'but I don't buy into a longer-term future of China', says the former chief economist of Deutsche Bank Group. As far as the longer term is concerned, 'I'm a bull for the United States and for the US dollar', he declares, adding though that he's not too upbeat about the greenback's prospects over the next three years. Since retiring at the end of 2009 from the German bank, where he had been chief economist since 1990, Professor Walter has continued to air his views on the global economy, consensual or controversial - only he's now doing it in the name of Walter & Daughters Consult, which got underway in Germany early this year after Christine and Jeanette, both economists themselves, left their jobs to join their father as his support crew. In town on a barely 30-hour visit this week, Prof Walter spoke to BT after addressing a breakfast meeting of the Singaporean- German Chamber of Industry and Commerce on the euro and other key economic issues of the day. He doesn't share the worries of those who point to risks in China's banking or property sectors, and has 'no doubt' that the Chinese economy will still clock about 10 per cent growth next year, he says, but remains unconvinced about its long-term might. 'So I'm not sceptical for the short term; I'm more sceptical than almost everybody on the medium and the long term on China,' he says. In his view, theirs is a demographic problem. In any case, he reckons that China's economic growth 'will voluntarily be moved from 10 per cent to over-7 in the next few years to something like 5 per cent after 2020 in order to preserve the local environment'. China will become increasingly dependent on imports for agricultural and energy supplies, he says. Meanwhile, the US will, despite its intractable fiscal problems, 'remain the No 1 power, even in the middle of the 21st century', he declares. As for talk about the eventual demise of the euro, Prof Walter says: 'The euro will stay, with pain.' But Europe's leaders, and particularly the European Commission, must eventually work towards some 'new form of political arrangements' for the EU, he says. 'I think that's the direction to go but it will be a very bumpy road, and it will not be a fast track,' he adds. Indeed, Europe's growth will 'not be impressive' in the near term, with a few countries mired in 'imbalances, like the US'. But his own country Germany - which he describes as 'the little locomotive of Europe' - is seeing good growth and 'will be perfectly capable of pulling the small guys around us', he says, citing Austria, Belgium, the Netherlands and Switzerland. Prof Walter also points to who he reckons could be 'potentially the stars of the next decade'. In relative terms, he says, 'I'd suggest that those countries that are very strong in supplying energy and agricultural products will be promising countries as well'. So 'Latin America will be something to watch, if they improve their governance and their infrastructure', he says, citing Brazil particularly, with a new leader in charge, as 'a very interesting case' that could exceed expectations. Mutual Funds Are a Scam, But Don't Bet Against America!!! With the vast majority of fund managers underperforming the market and fees eating into your returns, "mutual funds are a scam," says Phil Town, author of Payback Time. Citing Forbes research, Town says 96% of active fund managers underperform the market over periods of 15 years or longer. Meanwhile, he says even relatively small 1.5% management fees can cut your returns in half over a 40-year period, citing research by Vanguard founder John Bogle. "Those little fees kill you," Town says. "It's got to be some kind of scam. Those guys are not doing what they say they can do." The Simple Strategy: "If you don't know what to do as an investor, put a little money away every month and put it in the SPY and maybe pick one international fund to get a ride on China," Town says. "But I wouldn't bet against the U.S. You'll be glad 20-30 years from now that you kept your money here." The problem with that strategy, Town says, is the Dow could "very easily" remain range-bound between 14,000 and 8000 for a very long time. "That will kill you" if you're planning to retire within the next 15 to 20 years, he says. "You come out down the road and all you've got...is what you put in." Stockpiling Stocks: Town recommends boning up on a handful of stocks and trading in and out of them over a long period of time, as detailed here. "We're not just buy and hold -- we're buy when they're cheap and sell when they're expensive," he says. "If you do that a couple of times, those returns are very much higher than" the broad market's long-term average of 7%. Personally, I would suggest lazy investors to dollar cost average 50% on SPY and 50% on one of the emerging market ETF on a monthly basis. There is a 90% chance that these investors will outperform the market. Tear down this Chinese wall. In his famous 1987 speech in Berlin, U.S. President Ronald Reagan delivered the exhortation to Soviet leader Mikhail Gorbachev: “Tear down this wall.” Contrary to everybody’s expectation, the wall started to come down only two years later. It is about time to give the same directive to communist China. The Chinese wall is metaphorical, but equally hideous: It limits freedom of expression, assembly and movement. It prevents the Chinese from pursuing their happiness and choices freely. If there weren’t enough moral and humanitarian reasons to make that exhortation, here is an economic one: The lack of freedom in China is the main cause of imbalances in the world. It is well-known that the Chinese trade surplus, or the excess of its exports over its imports, is the counterpart of too much saving, which leads to unfair advantages and possibly deflationary pressure on a global scale. The causes of this imbalance, and the potential remedies, are disputed. The prevailing view is that it is due to China’s undervalued currency. By keeping the yuan artificially low, the argument goes, the Chinese are dumping underpriced products on Western markets, wiping out the competition unfairly. It is incumbent upon the Chinese government, the reasoning continues, to stop manipulating its currency and let it strengthen. This theory doesn’t explain two facts. First, the Chinese cost advantage in the products they export exceeds the 20 percent to 30 percent difference that a stronger yuan could achieve. In this situation, a currency revaluation may mean Americans will pay more for Chinese imports, without reducing the amount imported by very much. The dollar’s real effective exchange rate is now almost as low as it has ever been since the end of the Bretton Woods currency-exchange system. Why then does China export so much more than it imports? The answer comes from simple accounting. For every country, the current account is equal to the difference between the income produced and the sum of domestic investment and consumption. When a country consumes and invests less than it produces, it is bound to have a current-account surplus. In the case of China, a country that grows 9 percent a year and invests 43 percent of its gross domestic product, it is hard to argue that it invests too little. But it is very easy to argue that it saves too much: 54 percent of GDP versus an average of 33 percent among developing countries and 17 percent among Organization for Economic Cooperation and Development economies. So China’s surplus is due to its excessive saving, not to its undervalued currency. How can we deem Chinese savings excessive? In a free country, the aggregate consumption-saving decision is the result of individual choices, which reflect the preferences of its citizens. It would be very paternalistic of us to argue that savings are excessive. The point, though, is that China isn’t a free country and the economic decisions of Chinese aren’t driven by market forces. They are influenced by political decisions made by a small self-appointed elite. This group has decided that the accumulation of claims on the rest of the world is more important than the standard of living of the current generation. The excess savings don’t reflect the will of the Chinese people. Most of it doesn’t come from household savings, but from the corporate sector, especially government-owned enterprises. At the same time, Chinese wages are kept low by preventing labor from organizing and limiting the flow of information. Not only does this provide an unfair advantage to Chinese producers, but it prevents Chinese workers from having the resources to buy American steaks and iPods. A redistribution of income would benefit the Chinese people and the world alike. Income inequality in this workers’ paradise is among the highest in the developing world. In addition, some more generous social-security system -- now almost non-existent -- for Chinese families would lower their precautionary savings. The U.S. government should stop bashing China for its currency policy, while the Federal Reserve engages in massive quantitative easing. It’s hypocritical and leaves the Chinese with an easy way to respond. Instead the U.S. should regain the high ground and lecture them on what’s best in America: freedom. Accusing communist China of keeping workers’ salaries artificially low and not being pro-workers would embarrass the nation’s government. Learning from Reagan, we can stand on our beliefs. If we do, the Chinese wall will come down sooner than we expect. If fortune favors the brave, is this the time to take a bet on Ireland? And if so, how can you do it? The idea of investing in Ireland right now isn't as crazy as it sounds. For investors, crisis usually means opportunity. The bailout of the suddenly unlucky Irish, and the arrival of the International Monetary Fund to administer their patented brand of financial emetic, needn't be as bad news for the markets are some might assume. It's hard to remember now, but the "tiger" economies of southeast Asia went through something even more severe back in 1998. Anyone who braved the maelstrom and invested in the Thai, Malaysian or Indonesian markets at the time has made a fortune since. 1. The iShares MSCI Capped Investable Market Index Fund. In normal circumstances, this kind of low-cost exchange-traded fund would be the way to go, offering cheap access to a country's entire stock market. And it would save you from the problems of having to pick individual stocks–a challenge even in normal times. But take a look under the hood first. The Irish stock market is unusually small, and heavily skewed towards a few big companies. So is this fund. Some 23% of the fund is invested in CRH, a multinational building supplies and aggregates company and 14% is invested in food ingredients company Kerry Group. These stocks have little relation to the Irish economy. They just happen to have their historical roots there, and their market listing in Dublin. Most of their business is overseas. Their stocks haven't collapsed in the crisis. So you aren't getting a firesale price. 2. The New Ireland Fund. This is a closed-end fund, a mutual fund that issues a fixed number of shares that trade on the stock market like any company stock. Unlike the index fund, it's actively managed, which means the manager can pick individual stocks. But it's still quite concentrated. And many of its biggest holdings, once again, are international companies that have little connection to the Irish economy, such as CRH, low-cost airline Ryanair (Europe's answer to Southwest), and Kerry Group. Manager Peter O'Donoghue says he's also finding some good opportunities in some niche agribusiness companies such as Glanbia and Origin Enterprises. But most of these stocks have been doing just fine. They haven't collapsed in panic. The stocks that have are the banks, and this fund doesn't own any. Mr. O'Donoghue plays a conservative hand, and focuses on companies with strong balance sheets. Ajai Chopra, left, Deputy Director of the European Department of the IMF and a colleague pass a beggar as they make their way to the Central Bank of Ireland for talks with the Irish government in Dublin last week. This fund has high expenses, north of 2%. But it comes with an advantage: Right now shares are trading at a hefty 15% discount to their underlying net asset value. 3. Bank stocks. If you feel brave you have the chance to stick your head right into the mouth of the Celtic Tiger by buying stocks in Allied Irish Banks or Bank of Ireland. The banks are the ones whose disastrous loan books precipitated the crisis. Both have depositary receipts traded in New York. Both, predictably, have collapsed. Allied Irish, $63 per ADR in early 2007, slumped another 19% Tuesday to 90 cents. Bank of Ireland–the formal name, magnificently, is The Governor and Company of the Bank of Ireland–has collapsed from a peak of $98 to $1.68, down a further 25% on Tuesday. Mr. O'Donoghue calculates that both may end up nearly worthless. Nobody knows how much extra money they will need, nor the terms they will get. Stockholders are at the bottom of the capital tree. They may get diluted or wiped out altogether. However, a hedge fund manager in London I know is taking wagers on both. Of the two, he prefers Allied Irish. His reasoning? While he accepts investors may yet get wiped out, he thinks there's also a good chance of making a fat profit. And, as we all know, banks get special favors from governments. Cynical, but true. 4. British banks. If you don't like extreme sports, these may be a better bet. Why? Their stocks have been marked down in the worries about the crisis–and yet they're benefiting from it, as alarmed Irish savers withdraw their money from banks in Dublin and send it to banks based in London instead. All banking stocks need warning labels slapped on them–you can wake up one day to find your stake has vanished in the night–but for those willing to take a limited bet both Lloyds and Barclays have American Depositary Receipts. As ever, you pays your money and you takes your chances. No tears. 5. Irish government bonds. Loomis Sayles bond guru Dan Fuss was loading up on Irish bonds at their depths last week, when they were paying about 7 percentage points more per year than German government bonds. He told me: "We have a short term problem that is extremely serious but we think the country will survive just fine. At the 'wides' the bonds were yielding nearly 700 basis points more and similar maturity in bunds. We think both are money good." However, the bonds have rallied since then–the interest rate gap is now below 6%. It can be difficult and costly for an ordinary U.S. investor to buy foreign government bonds. And, bluntly, I'm wary of bonds at any price. I think inflation is coming, sooner or later. I'd want more than the promise of a 7% profit to go to the effort of buying foreign bonds. 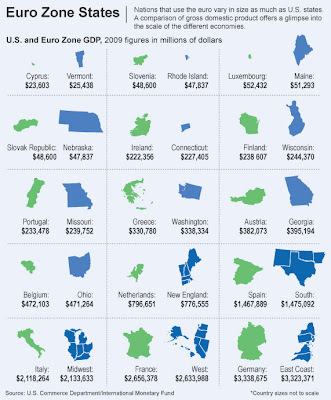 To get a sense of scale, Real Time Economics compared the 2009 output of goods and services for members of the euro zone to the output of U.S. states. The economy of Spain, for instance, is about the same size as the combined economies of Texas, Oklahoma, New Mexico and Arkansas. Italy is nearly as big as Illinois, Indiana, Michigan, Ohio, Wisconsin and Kentucky combined. Meanwhile, hopes for rescue rest on the shoulders of France, whose economy is bigger than that of the entire West Coast including Alaska, Hawaii and the U.S.’s largest state California, and on Germany, which is about the size of New York, New Jersey, Pennsylvania, Maryland, Virginia and North Carolina — plus the District of Columbia. 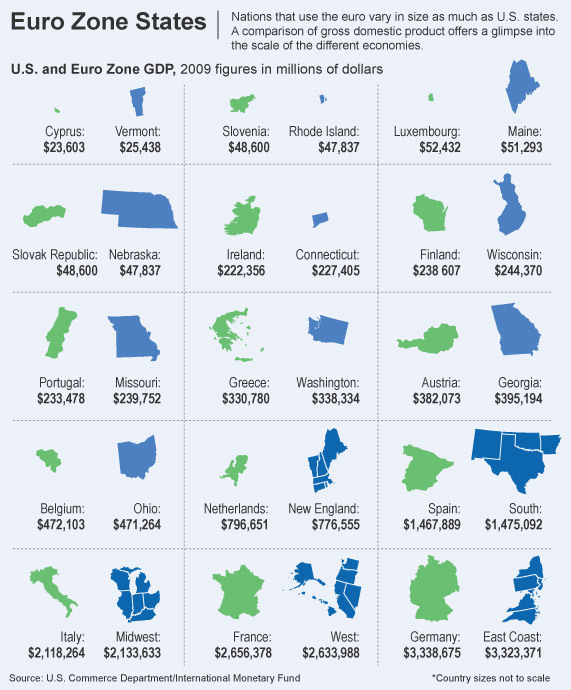 The smallest euro-zone economies aren’t even as big as the smallest U.S. state. The economy of Cyprus is smaller than the economy of Vermont. And tiny Malta, for example, has a smaller GDP than that of the city of Amarillo, Texas. In all, the gross domestic product of the euro zone in 2009 was 12% smaller than that of the U.S.
"The financial world should learn from Epicurus - It does not matter what you have for meal, but it matters who you have it with. Bankers makes millions and billions at the expense of others, how much spiritual wealth could they really achieve at the end of the day?" British philosopher Alain De Botton discusses the personal implications of the ancient Greek philosopher Epicurus (341-270BCE) who was no epicurean glutton or wanton consumerist, but an advocate of “friends, freedom and thought” as the path to happiness. Forget the axis of evil, its the axis of oil. The Cold War and the War on Terror were about ideology and globalization. The 21st century will be dominated by the struggle for energy: It will be every man for himself and it’s going to get dirty. In the two-part documentary Energy War, VPRO’s Backlight investigates the major developments with regards to energy sources. Featuring NY Times columnist Thomas Friedman. The film describes the geopolitical consequences of the dependency on fossil fuels. In the struggle for the last sources of fossil fuels, countries all over the world are forced to take new political and moral decisions and have to enter into awkward alliances: rogue regimes must be tolerated and befriended. With a special focus on the gas conflict between Georgia and Russia and the position of Saudi Arabia. Featuring a.o. Thomas Friedman, author of international bestseller The World is Flat. Friedman sheds his light on the inverse connection between rising oil prices and the establishment of free democracies. The film then moves on to take a look at the international markets for alternative energy. If oil and gas are scarce and expensive in the future, where will countries turn to keep their economy going and their population warm and happy? Could solar energy or bio fuels become the main energy sources of the post-fossil fuel era? Will governments, multinationals or small producers be the motor of the green race? WikiLeaks brings truth to the world by publishing fact-based stories without fear or favor. You can help support our independent media by donating financially. Our organisation exists because of the work of many volunteers who have contributed thousands of hours to building WikiLeaks from the ground up. But we still need donations to pay for computers, expert programmers and other bills. You choose how much you can donate, we don't recommend any particular amount. Just do what you think is right. Based on Forbes Magazine in 2009. There is a total of more than 800 scattered globally. You’ll find an astounding collection of 329 billionaires throughout the United States. Some names are familiar to the general public while others are not. They include Lenore & Walter Annenberg, Warren Buffett, Bill Gates, Steve Jobs, Abigail Johnson, Peter Kellog, and many more. Makes you want to book a flight, stay in a Los Angeles hotel and hope that the billionaire vibe rubs off on you! In China you’ll find 79 billionaires with net values ranging from $1 billion up to $16.2 billion. The most notable is Yang Yuiyan, considered not only the wealthiest female but the richest in Mainland China, having inherited her father’s business at the very young age of 26. India is proud to call itself the home of 58 distinguished billionaires. From Anu Aga to Yusuf Hamied and Azim Premji, each has an incredible story. Anu Aga, for example, is one of the 8 wealthiest Indian women in the world, having once served as the chairperson of the Thermax Ltd. engineering firm. In Germany you’ll find 54 incredible billionaires with net values ranging from $1 billion up to $21 billion. They include well-known names like Otto Beisheim, Klaus-Michael Kuhne, Friedrich Karl Flick, Johanna Quandt, Theo Albrecht, and Karl Albrecht. 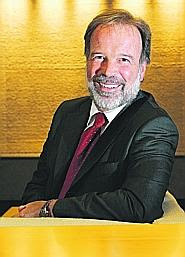 Karl Albrecht, with a fortune totaling $21.5 billion, made his fortune while working with his brother Theo. They’re responsible for opening the popular discount store known worldwide as Aldi. Russia is home to a group of 32 distinct billionaires with fortunes valued anywhere from $1.2 to 9.5 billion. Mikhail Prokhorov is one of the most notable, with a net worth of $9.5 billion. At the young age of 44, he’s considered one of the top industrialists in Russia. Today, this 6’9” tall entrepreneur sits on the board of Polyus Gold (the largest producer of gold in the world) and is the president of the famed Onexim Group. In the United Kingdom you’ll find 25 British billionaires, each with an incredible history and back story. Take Bernard Lewis, for example. Born in 1926, he started his career as an entrepreneur selling fruits and vegetables in North London. He then went on to develop the famous River Island brand of clothing. If you head towards Canada you’ll find 23 prominent billionaires, with fortunes valued anywhere from $1.5 billion up to $24.41 billion. The Thomson family, of The Thomson Corporation, has accumulated a fortune of more than $24 billion. They did so by manufacturing educational textbooks, resources, and reference materials with worldwide distribution. Hong Kong is home to 19 of the world’s most prominent billionaires. The most impressive is Sir Li Ka-shing, an individual with a net worth ranking in at $16.2 billion dollars. At the age of 80, Sir Li Ka-shing is actually the 12th richest individual in the world, having made his fortune both operating container terminals and retailing health and beauty products. Japan is next on the list with a total of 17 billionaires, all of which are individuals. They include Akira Mori, Hiroshi Yamauchi, Hiroko Takei, Takemitsu takizaki, and many others. Their net worth ranges from $1 billion up to $5.5 billion! Indonesia is home to 15 distinct billionaires. According to Forbes, 10 of these are billionaire families sharing the wealth and 5 get to keep their earnings to themselves. Individual billionaires include Eddie William Katauri, Martua Sitorus, and Peter Sondakh – the latter just making it onto the list at the age of 56 with a net worth of $1 billion. Who would think the tiny Republic of Singapore would be crammed with so many millionaires? The country, all of just 247 square miles, has emerged from the recession and has rebounded in a big way. Its GDP, exports and manufacturing are all rising, and so, too, are home prices. That has led Singapore to boast the highest concentration of millionaires anywhere on the planet. Among its very rich: Ng Teng Fong, a real estate tycoon, and Wee Cho Yaw, who runs United Overseas Bank, one of Singapore's big lenders. Hong Kong, the home of Li Ka-shing, who runs conglomerates Cheung Kong and Hutchison Whampoa, had 205,000 millionaire households in 2009 and takes the number two spot for percentage of millionaire households. Hong Kong's close relationship with mainland China brings benefits and risks, but it's been good for many of the wealthiest, who made their money by investing in a real estate market that has no shortage of swanky hotels and malls. The Swiss economy is recovering from slow growth during the recession, but a good many of its citizens thrived during the upswing, bringing it to third place in percentage of millionaire households. The country boasts 285,000 of them, up 19.5% from 2008. Driving the recovery: manufacturing, rising exports and consumer spending. Among the country's rich: Swiss biotech tycoon Ernesto Bertarelli, who is, perhaps, better known for winning the America's Cup in 2003. The rising price of oil has led to more millionaires in this tiny country. With some 100 billion barrels of crude, Kuwait has been growing rapidly. But the oil-dependent nation now plans to spend up to $140 billion over the next five years to diversify away from oil and to attract more investment -- a move that could help it ascend this list's ranks. Such a strategy may help billionaire Nasser Al Kharafi, chairman of one of the most diversified and largest conglomerates in the Arab world. His food division, Americana, has the Middle East franchise rights to KFC, Wimpy, TGI Fridays and Pizza Hut, among others. Qatar's economy expanded by about 8.7% last year, thanks to growth in the natural gas business. That helped the country, already the world's largest gas exporter, to emerge from the global economic crisis pretty much unscathed, leaving many of its millionaire households in good stead. Among its megarich: Bader Al Darwish, with a fortune of about $1.7 billion. Al Darwish runs Darwish Holdings, which operates businesses including real estate, investments and retail services. As the world's third-largest oil exporter, the UAE's economic growth is expected to rise to 3.2% this year, after posting a 1.3% increase in 2009,. Like others, its oil business has generated wealth among its citizens. It also helps that UAE isn't expected to suffer from the eurozone debt crisis. The country is home to Abdul Aziz Al Ghurair and his family, who run Mashreqbank and the second-largest flour milling company in the Mideast, as well as megamalls. The 4.7 million U.S. millionaires in 2009 was up by 15.1% over 2008. But as a market percentage, the U.S. falls relatively low on the top 10 list. The country, which is home to two of the world's wealthiest people, Bill Gates and Warren Buffett, saw its economy bounce back in 2009 from the year before as the Dow Jones Industrial Average rose 40%. By the end of 2009, the economy grew at its fastest pace in more than six years, even though many businesses put the brakes on hiring. Suffering from spiraling debt and political problems, Belgium still managed to hold on to a number of millionaires. The country has set a goal of getting its budget deficit to 4.8% of GDP in 2010, which is far below Europe's average. But Belgium's total debt will rise above 100% of GDP, placing it behind only Greece and Italy. The debt crisis in Europe will also likely take a toll on the country's economy in 2010. The good news is that Belgium has a trade surplus, and household savings are high. Among its richest: Albert Frere, who founded the media, utilities and oil conglomerate, Compagnie Nationale a Portefeuille. Unlike other markets, the story in Israel wasn't about rising real estate values or credit, but about gains in technology, which some say will help lead the country to continued economic growth. While 2009 was a good year for the economy, the current eurozone crisis could hurt Israeli exports because about 33% of them go to Europe. Rich man in Israel: shipping tycoon Sammy Ofer, worth north of $6 billion. Taiwan may be last on the top 10 list -- but that's still quite a feat. The country was hit hard by the recession mostly because its economy depends on trade. But as the world economy skittishly improves, Taiwanese families have seen their fortunes rise. The country now has some 230,000 millionaire households. That's an increase of 22.1% over 2008. One of its richest is Terry Gou of Foxconn, a maker of electronics for Apple (AAPL), Nokia (NOK), Nintendo and others. That company has been in the news recently because 13 of its workers have committed suicide or tried to. All-star team of traders and academics lost billions. Why? "Key lesson to be learnt from the collapse of LTCM"
WikiLeaks Friday moved to a new Switzerland address after the American domain name system provider, EveryDNS, withdrawed service to the wikileaks.org. EveryDNS had claimed in a statement that it dropped the website late Thursday because the attacks threatened the rest of its network. EveryDNS provides access to some 500,000 websites. WikiLeaks has angered the US and other governments by publishing secret diplomatic documents recently. Almost half a million secret documents about the wars in Afghanistan and Iraq were also published by the whistle blower website founded by Assange. Amazon.com Inc. which provided WikiLeaks with servers to distribute embarrassing state department communications and other documents had evicted it Wednesday. The site remains on servers of a Swedish host, Bahnhof. The ouster from Amazon came after congressional staff questioned the company about its relationship with WikiLeaks. The myth of Asia's miracle or the recovery of Asia? What if the US Dollar Collapses? Take a break, but don't get too addicted!